Recorded five months after Open Sesame, Hubbard absolutely on top of his game, Mobley sensationally bursting with confidence, the following week recording his own album as leader, Roll Call. Goin’ Up is total class, sublime. I have owned a Japanese pressing of it for some years and hardly ever bothering to play it as the pressing was entirely lacking in excitement. Hearing it in its full glory I am overwhelmed by it. The pressing makes the difference between wanting and not wanting to play it. All vinyl is not equal. Plastylite lives! Cover: Blue Note 1960 glossy laminate, thick card, built to withstand decades of wear. No name written on label or cover: clearly not taken to parties. Vinyl: BNLP 4056 original – DG both sides, 47 West 63rd, RVG machine stamp, ear, mono. Ok, do your worst, out with the Cohen Bible and tell me it’s not a First press, and I’ll cry. Lie to me if you have to! One of a string of chance events in a London record shop that brought me face to face with this gorgeous original Blue Note, not one I have ever seen before in the flesh. And it was all down to a “missing” copy of a Mose Alison’s Esquire “Back Country Suite”. Bringing the Mose Allison sleeve from the racks to the counter, the staff were unable to find the Esquire in the shelves, it seemed to have been misfiled. I shrugged it off – these things happen – and offered a phone number should it turn up. However they urged me to come back in a half hour, when the jazz specialist would be back from lunch. He might know where it was. I sauntered off to Rays Jazz, picking up the promo copy of Sam Jones Soul Society in the mean time, and returned a half hour later – ” Any sign of the Mose Allison? Yes, the man was back from lunch and had found it. “By the way, any interest in these?” he said, depositing twenty LPs on the counter. They have just come in. I arranged the sale over the phone with a guy who said they had been in his attic for thirty years. We both laughed. Yes, unplayed for thirty years, but what did you play them on forty years ago? A Dansette portable record player with a broken needle? We have all been there. Out came the pile. Oh My God, some original Blue Notes. I feel faint!. First off a few I already had excellent originals of, damn. More duplicates, same taste as me obviously, often how it happens. Then I saw the Hubbard. I picked it out. OMG, 47 West 63rd! DG! Mint!! “It’ll be expensive” I was warned, scurrying off to do another Popsike search. Yup, these guys are professionals. He knows exactly what they are worth, and he knows I know, we both know there will be no turkey shoot. Deeper in the pile, some Monk Riversides – OMG, 1957 White label first pressings!. We reached the end of the first pile. “More?” He said. Jeez, out came a second pile. Then a third… the thought came into my head, I wonder where the nearest Cardiac Defibrillator is? Then the airline safety announcement ” rremembering that the nearest usable exit may be behind you. Put on your own mask on before helping others with theirs” I wont be helping others, I’m outa here!. It was a long walk to the nearest bank. “Is there a daily limit on cash withdrawals”? I asked a lolling assistant hoping I might want a mortgage including Payment Protection Insurance. I might need to fall back on Plan B, Never leave home without the imitation Glock water pistol and brown paper bag – “Nice bank, shame if something happened to it. Fill the bag, no one gets hurt.” Though they may get a nasty wash.
Luckily the card machine coughed up the necessary cash and I took off back to the shop at an urgent pace. My records had been washed and wrapped. As is customary in such deals, I felt it incumbent to spread twenty pound notes across the counter. A lot of the counter was covered by the time I finished..
Err, you still interested in the Mose Allison? he laughed. Why not? I said. It’s lucky. This entry was posted in Blue Note, Freddie Hubbard, Hank Mobley and tagged Blue Note, Freddie Hubbard, Hank Mobley, McCoy Tyner, Paul Chambers, Philly Joe Jones by LondonJazzCollector. Bookmark the permalink. I have an 84056 version which says reprocessed stereo but it sounds good. Was it recorded in mono? 4056 Freddie Hubbard Goin’ Up Recorded 06-Nov-60 Released May-61 only in mono. First stereo issue was by Liberty. Rudy recording everything to two-track from around March, 1957, so a candidate for a later stereo release but almost certainly mastered by Liberty engineers, not Van Gelder. It was customary during the stereo craze in the later half of the ’60s and early ’70s to issue everything or labelled everything as as “Stereo”. 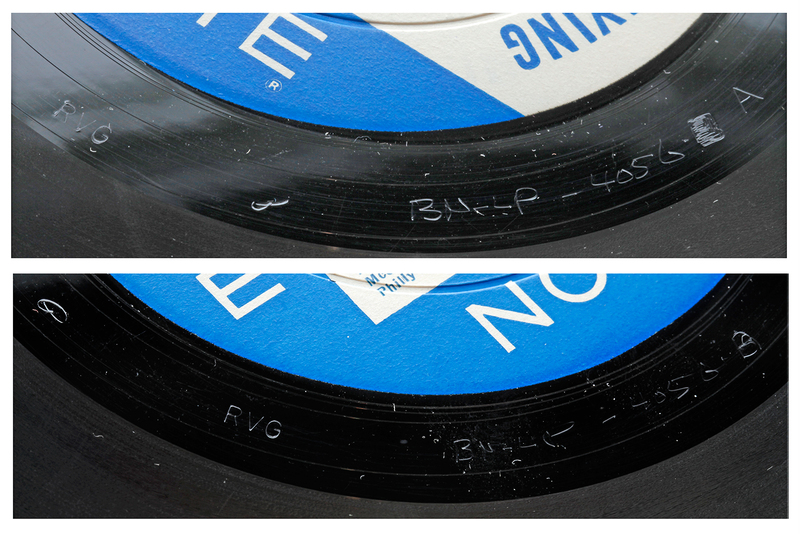 Often these were labelled “Electronically re-recorded or reprocessed for stereo”, or some such description. These are rarely if ever “fake stereo”, merely a sometimes painful instrument hard panning Left Right Centre, taken from two track tapes not intended for stereo. If you ever chance on the mono, it exudes glorious room-filling power. Some of those I have claim to be stereo but are a straight mono pressing, not stereo at all. If it sounds good to you, that is what matters. FWIW Rudy’s engineering on this date was superlative, so all they had to do was not mess it up. FINALLY tracked down a copy of this. It’s a later blue and white label Liberty issue without the Van Gelder stamp, but as with others in this category it still plays bright and fresh. I think these later Liberty’s without the RVG stamp sound a bit cleaner than the later ones with RVG stamp. Likely new stampers being used. The vinyl isn’t the quietest out there, but it is a NM looking copy and for $16 I’m not complaining! Wonderful session with everyone on top of their game. Great stuff. Always fun to see Elvin Jones on a Blue Note title! Meant always nice to see McCoy Tyner on Blue Note! please let me know which shop that was … I’m a Londoner myself! Congratulations. A superb acquisition. And the front- and back cover look so good that I’d have believed you if you’d said that you flashed yourself back to 1960 to buy it the day it was released. This Hubbard is one of my favourites and if only I had it on vinyl myself. The split second of run-in groove on your needle drop reveals a smooth, clean and well preserved slab of vinyl. After all these years! And that needledrop sounds excellent! p.s. I hope the shop used 2012 popsike prices and not 2006 prices as there is a big difference. There just isn’t the same amount of money around nowadays… and prices reflect this. In my experience professionals look for the most recent auctions with like-for-like quality, ignoring freak highs and lows. Its what I would do in their shoes. What we don’t know of course is what they paid for it. Probably a third of what I finally did. They got overheads, I don’t begrudge them that. From talking to sellers, there are those who want the max price, however long it takes, and others for whom it is all about turnover. Ship it in, mark it up, ship it out. Footfall and volume. And they are all still in business. Well put. So many people seem to get hung up on getting the “going rate” for something, rather than moving it on for a decent profit. Seen lots of items on eBay up for auction time and time again – and never selling – because the seller thinks its worth xxxx. There is an eBay seller appropriately called “basketcase” that does this all the time. Dont worry, according to Cohen you got the real deal. W63i, dg, P, RVGs, NYC, lam.